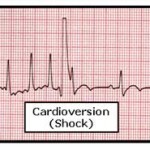 Electrical cardioversion–Known as “direct-current” or DC cardioversion, a perfectly timed, synchronized electrical shock is delivered through the chest wall to the heart through paddles or special electrodes that are applied to the skin of the chest and back. 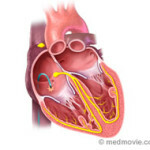 The procedure disrupts the abnormal electrical circuits in the heart; thereby, resetting the heart to a normal rhythm. This immediate interruption of the abnormal beats allows the electrical system of the heart to regain control and restore a normal heart rhythm. Electrical cardioversion is performed in a hospital setting where blood pressure, heart rhythm and oxygen levels are closely monitored. Normal sinus rhythm can be restored over 90% of the time. 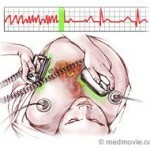 However, the atrial fibrillation or other abnormal rhythms may recur over time. Your doctor may likely prescribe medications or recommend a catheter ablation to reduce the risk of the atrial fibrillation coming back. Because in people with atrial fibrillation, the atria (upper chambers of the heart) are fibrillating as opposed to squeezing, there is a risk that blood clots may form. The process of restoring the rhythm to a normal one could dislodge a blood clot from the heart resulting in a stroke. To help prevent blood clot formation and reduce the potential for stroke, a blood thinner is given with medications called anticoagulants. Anticoagulant medications that are often used are heparin, warfarin and aspirin. In a patient with A. flutter or A. Fib that has been present for over 48 hours, the blood must be sufficiently thinned for at least 3 to 4 weeks prior to the cardioversion procedure. Alternatively a transesophageal echocardiogram (TEE) may be performed to make sure there isn’t a blood clot in the atrium. During a TEE procedure, a special probe is placed in the esophagus, allowing your doctor to directly visualize the atria. Because for blood clots to form takes several hours, cardioversion can be safely performed without anti-coagulant medication in patients who have been in AF or AFL for less than 48 hours. Typically, blood thinners are continued after the cardioversion for at least 4 weeks, often longer.